Before taking anything apart, I looked into sending the camera to someone to have it professionally repaired. This is always a good option, for valuable cameras, or if you feel unsure about your own DIY ability's. In my case, the cost of having the camera repaired would likely have been more than I paid for it in the first place, and I rather liked the idea of taking it apart. So I began researching possible causes for my focusing problems. To understand the possible focus problems, we need to understand the construction of a TLR (twin lens reflex, is the generic term for this sort of camera) and how the focusing works. When you look down into a TLR, you see the image projected by the viewing lens onto the focusing screen. The mirror in the top redirects the light upwards and flips the image the right way up. The taking lens projects the image onto the film, and also contains the shutter mechanism. The lens board holds both lenses in alignment, and moves and out to focus closer, or in to focus further. To achieve proper focus the viewing lens and the taking lens need to be aligned so that they are both focusing at the same distance. The image on the focusing screen will then match the image that is captured on the film. One more element that will come into play is the focusing knob, or to be more precise the distance scale. Ideally both the lenses and the distance scale will all be aligned to the same point. turn the focusing knob to 3 meters, and both the viewing and taking lenses will show an object 3 meters away as sharp. there are a few different variations that may appear. 1. The taking lens and the viewing lens are aligned, but the distance scale is out of alignment. 2. The taking lens and the distance scale are aligned, but the viewing lens is out of alignment. 3. The viewing lens and the distance scale are aligned, but the taking lens is out of alignment. 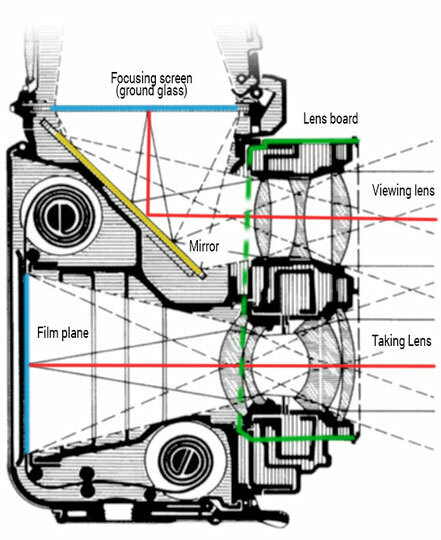 The entire lens board can also become misaligned (side to side for example) which causes the focus to be different across the image (the focal plane is no longer aligned with the film) making it effectively a tilt lens. Luckily this was not a problem with my camera.